Prilosec (omeprazole) is a proton-pump inhibitor (PPI) that is used to help treat gastric ulcers, duodenal ulcers, gastroesophageal reflux disease GERD), and erosive esophagitis. Prilosec is also used to treat H. pylori (a common ulcer-causing bacteria). Prilosec was the first drug from this type of medication and is also over-the-counter by its generic name, omeprazole. It is approved for the treatment of frequent heartburn that occurs more than 2 times per week. Other similar PPI medications include Prevacid (lansoprazole), ​AcidpHex (rabeprazole), Protonix (pantoprazole), and Nexium (esomeprazole). There does not appear to be a significant difference in efficacy in any of the different PPIs on the market. Several studies show that medications like Prilosec provide better relief and overall healing from acidic damage than H2-blocking medications like Pepcid and Zantac. This is true for both erosive and non-erosive inflammation in your esophagus, stomach, and intestine. However, your doctor may also recommend an H2-blocker if you have night-time acid reflux that isn't controlled by Prilosec. Proton pump inhibitors like Prilosec help to block gastric cells from producing acid in the stomach. It does so by blocking an enzyme that allows acid to be released from a proton pump in the gastric parietal cells. Prilosec prevents too much acid from being released that can cause harm to the tissue lining your esophagus, stomach, and intestines. Prilosec will generally start taking effect between 30 minutes and 3.5 hours. Prilosec should be taken before a meal; preferably before breakfast. Capsules should be swallowed whole and not chewed. If you have swallowing difficulties, the contents of the Prilosec capsule may be mixed into applesauce or similar substances. Make sure that the pellets found within the capsule are not crushed or chewed when swallowing. Usual doses include 20mg once a day, 40mg once a day, and 60mg once a day. However, your doctor may ask you to try 20mg twice a day if you have symptomatic relief during the day but experience night-time acid reflux. It is important that you follow your physician’s orders on dosing, as more Prilosec does not equal better results. You should consult your physician if you are taking any of the following medications as they can interact with Prilosec. As this list is incomplete, you should always contact your physician prior to starting a new medication. Your physician or pharmacist can run a check for interactions between your prescribed medications. 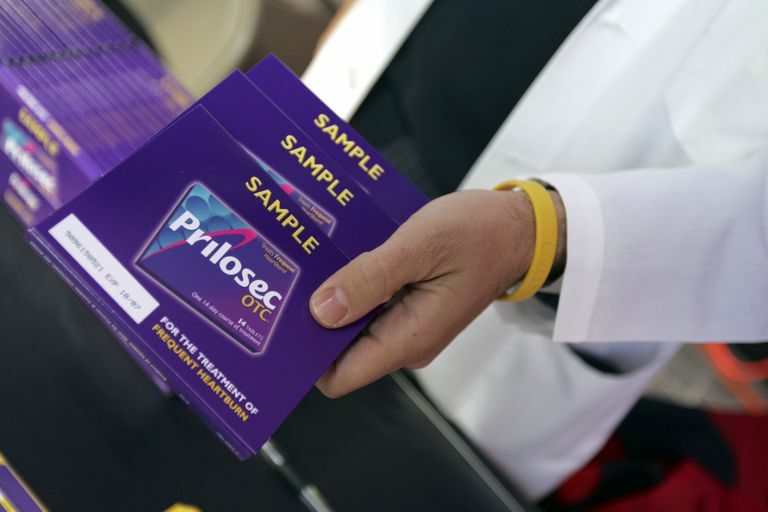 Prilosec and other proton-pump inhibitors (PPIs) have been linked to increased risk of bone fractures, including fractures of the wrist, spine, and hip. The highest number of such fractures occur in people who take these drugs at high doses for a year or longer. Please note that over-the-counter PPIs are meant to only be taken for a few weeks, and ideally under the supervision of a physician. If you need these medications long term, you should discuss such continuing treatment with your physician. Before beginning Prilosec, consult your physician. Prilosec is not for acute symptoms (symptoms occurring right now) of heartburn. Rather, it is used for long-term resolution of symptoms. If you have black stools or bright red blood in stools, you should seek medical attention rather than using Prilosec. If you are pregnant, planning to become pregnant or nursing a baby, you should consult your physician before taking Prilosec. Always have a doctor or pharmacist review your current medication list before starting a new medication. AstraZeneca. Prilosec Prescribing Information. Updated December 2016. McDonagh, MS, Carson, S & Thakurta. (2009). Drug Class Review: Proton Pump Inhibitors Final — Report Update 5. Oregon Health & Science University. Omeprazole. Medline Plus website. Updated July 15, 2016. Do You Know If Your PPI Is the Right One For You?